When it comes to maintaining your home, many people overlook their roofs – which some could argue is the most vital aspect of your home. It protects your family and valuables from the outside elements, while tying the exterior of your home together visually. While your roof is often overlooked on that spring cleaning checklist, its maintenance is extremely important. Similar to sweeping the front porch or cleaning out the gutters, your roof needs to be cleaned, maintained and assessed periodically. This enables you to prevent leaks, to detect minor problems before they become major problems, and to capitalize on the amount of time before you need to replace your roof. A regular cleaning and inspection of your roof will decrease the chances of premature leaks and slow the aging of your roof. Summer sun, heavy rains, gusty winds and temperature changes gradually break down your roof materials, decreasing the time before you need a complete re-roof. With ongoing maintenance, you will catch a leak that you didn’t know you had, clear debris that you could not see from the ground, and even clear off algae or moss before it grows out of control. Your roof, along with any flashing, vents or other roof accessories, should be maintained twice a year, as well after any major storm or weather event. The best times of year for your roof inspection are in the spring when you can check for any winter damage, and the fall when you can address any summer damage while also preparing for the cold season. Before you start to think, “Hey, I can get on my roof, sweep it and look at it myself!” consider the safety of climbing on your roof to maintain it yourself. It is estimated that at least 30,000 people are hurt each year from falling off a ladder alone. If you have no fear of climbing a ladder and walking around on your roof, however, you must also realize that having your roof maintained by a professional roofer at Big Fish Roofing will only benefit you. We possess the specialized knowledge, equipment, and training, as well as safety requirements, to inspect your roof for potential problems that you may not recognize yourself. We look at shingles – all day, every day – and can quickly spot any existing leaks or potential problems. The best type of planning is preventive planning. It will save you money, time and, often, a huge headache. Big Fish Roofing is here to help you find solutions to all your roofing issues. Our maintenance program is a great way to prevent major problems from taking place. Recycled Roofing Materials: It Really Is Easy Being Green! Each year, nine to eleven million tons of asphalt roofing waste are sent to landfills. Disposal fees amount to over $400,000,000. In spite of this — believe it or not — roofing projects can be environmentally friendly. In recent years, efforts have been made to devise ways to reuse and repurpose the materials that are used by roofing contractors. Asphalt shingles can be ground up, heated, and melted down in order to extract different components and repurpose them. The new material is used on roads, pavement, sidewalks, bridges, ramps, fuel oil, and pothole repair. The extracted waste is used for cold-patch or hot-patch additives. Asphalt shingles from one normal-sized roof can generate up to 200 feet of a two-lane highway. Wood shingles can be re-milled, chipped, or ground up to be used in boiler fuel, flooring, mulch, particle board, and animal bedding. Concrete shingles can be crushed into stone and used for a variety of purposes. Metal roofing can be heated, melted down, and combined with other metals to be reprocessed. The resulting substance is used for new roofing material, street signs, and food and beverage cans. Old shingles that are in good shape may be donated to charities such as the Habitat for Humanity ReStores or Reuse People, a non-profit that sends the materials to low-income individuals, families, and businesses in Mexico. Freecycle, craigslist, and Salvo are other avenues through which functional shingles can be picked up and taken away for reuse. Conscientious roofers, such as those at Big Fish Roofing Company, are doing their part to green it up by using earth-friendly materials and by recycling materials after cleanups. Big Fish Roofing Company recycles 80% of its waste materials. It sends some of its recyclable materials to Coastal Recycling Services in Jacksonville. The Big Fish Team is committed to finding new ways to reduce, reuse, and recycle. Won’t you join them? Posted in Recycling, Roofing Tips by BigFish : June 5, 2013 - 6:33pm | Comments Off on Recycled Roofing Materials: It Really Is Easy Being Green! are probably the least expensive type of shingle to install. are appropriate for most any style home, especially those with steep-sloped roofs. are light and require no structural reinforcement. are easy to install or replace because they are easy to cut and fit. are low-maintenance and easily walked on during inspections, maintenance, or repair work. are not requiring of special accessories for edges or flashings. are available in two different types, standard (organic) and laminated (fiberglass), as well as in a variety of colors, brands, degrees of fire resistance, and life-span ratings. are not as lasting as slate shingles. are easily damaged or blown off by high winds. are apt to scar or become otherwise damaged if hot. are easily damaged by mildew in shady areas of the roof. are key factors for a classic, natural looking roof style with unique character that may result in an increased property value. are available in a variety of widths, colors, thicknesses, and cuts. are energy efficient by insulating the attic and by allowing the roof to “breathe”. are durable, able to handle strong storms and debris, and easily walked on during inspections, maintenance, or repair work. are not as likely to deteriorate because of the elements when properly sealed. are less expensive than slate shingles. are more expensive than asphalt shingles. are not as long-lasting as other shingle types. are susceptible to rot, mold, and insect damage. are, in most cases, unrated by fire safety codes. are very attractive and unique, possibly resulting in an increased property value. Are available in a variety of sizes and colors. are there for the long haul, having a long life span. are expensive to install and to replace. are heavy and require structural reinforcement and special tools. are brittle, breakable, and not easily walked on during inspections, maintenance, or repair work. The professionals at Big Fish Roofing, Inc. in Jacksonville Beach Fl. are ready to help you make choices about the shingles that will be used to complete your roofing project. We have the experience and the expertise to handle any job… from the simplest using asphalt shingles, to the most difficult and precise using wood, shake, or slate shingles. Contact us at 904-685-8334 or online at www.bigfishroofing.com for a free estimate and consultation. Your roof is our canvas. Let’s make a masterpiece! Personal calendars don’t usually spotlight “Check Your Roof Day”. After all, nobody likes to go looking for trouble. However, knowing what to look for during a casual, regular inspection can help you determine if your roof needs fixing or replacing. The National Roofing Contractors Association suggests that you take a good look at your roof in the spring and in the fall. Where do you start? Inside the home, the attic is a good place to begin. Using a flashlight, check for trails and dark spots, areas showing water damage or leakage, sagging, or light coming in from outside. Other indoor signs of roof issues include: blistering or peeling of paint; stains, mold, or mildew on walls and/or ceilings; and an unexplained increase in your heating or cooling costs. Outside inspections are made visually by using binoculars or by actually going up on the roof. If you choose the latter method the safest route is to contact the professionals at Big Fish Roofing Company to do the inspection for you. If you are truly a do-it-yourself kind of homeowner, make sure to have proper safety equipment and a buddy standing by on the ground…with a cell phone and 911 on speed dial. check the gutter. Is it sagging, leaking, or holding asphalt pieces from the shingles? Is it properly attached? check the flashing. Is there damage or ineffective coverage? check under the eaves and overhangs. Are there signs of water damage that might be from leakage? check around pipes, fireplaces, sky lights, vents, and any other roof penetrations. Are their seals in good shape, or are they worn? check the shingles. Are they cracked, torn, bald, or missing? Are they curled or warped? 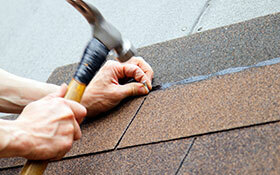 Asphalt shingles that are failing become brittle, crack, and come apart very easily. Failing cedar shingles split, fall apart, and may get mossy. Individual tiles on tile roofs might break. Wooden shakes may fall victim to wood-boring critters. check the nails. Are they popping up or rusting? Are there stains around them? check the seams. Are they open? check for sagging or unevenness. Are there any unsound areas? Check for mold, algae, and rot. Any of these will negatively impact the integrity of your roof. At the first sign of any roof damage or other roof related problem, contact Big Fish Roofing Company. Our licensed and experienced team of roofers will provide you with a free inspection, a work proposal, and an estimate of costs. We will work with you to make sure that your family has a safe and properly functioning roof over each and every head. 1. Choose and consult with an experienced (Big Fish Roofing), knowledgeable (Big Fish Roofing), insured (Big Fish Roofing), licensed (Big Fish Roofing), and professional (Big Fish Roofing) roofer. Check! 2. Select the appropriate roofing materials. Consider function and appearance. Read about the materials you choose. To Repair or To Re-Roof the Flat Roof: That is the question! Posted in Roofing Tips by BigFish : January 10, 2013 - 4:07pm | Comments Off on To Repair or To Re-Roof the Flat Roof: That is the question! © 2019 Big Fish Roofing All rights reserved.